Discover our Riding day on the Ales’ track. Come on the Pôle Mécanique of Alès, and enjoy a speed racing track to discover in normal or reverse way. Unique in Europe. ♦Breakfast free, cold and hot drinks given during the entire day. ♦Briefing and videos of your sessions to help you to step up. ♦A specialist in suspension Géomoto will be present on few dates. ♦Photos available on our Facebook page for free. ♦Catering on place, full meal for 13€. ♦Possibility to install yourself on the paddock from the previous evening. ♦Tire assembly service : 10€ for a taken wheel off – 20€ for a wheel to take off. WHAT DO YOU NEED IF YOU BEGIN ? ♦Leather suit in 1 or 2 pieces (connectable) and dorsal protection are mandatory. ♦Motorbikes : all type in good conditions. Contact us via the 04.66.43.19.41 or 07.87.84.13.07. Prices :from 90€ to 120€, 7 sessions of 15 minutes. 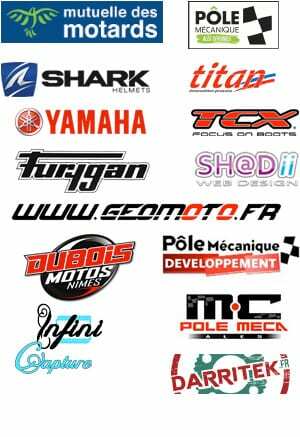 Organised by the Pôle Mécanique Moto Club, with supporting from Yamaha ⇔ Dubois Motos Nîmes ⇔ Pôle Mécanique Alès ⇔ Shark ⇔ Furygan ⇔ Mutuelle des Motards ⇔ Titan ⇔ TCX ⇔ Darritek ⇔ Yamalube. →Click on the picture to discover the normal and reverse ways of the track.